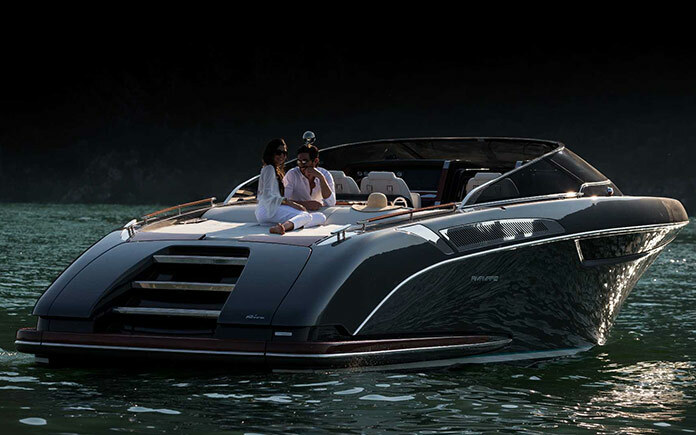 The well-known Ferretti Group has launched their latest model in their Riva yacht range, the Rivamare. The luxurious yacht measures an impressive 11.88 meters (39 ft) with a full beam of 3.5 metres (11.6 ft) and can carry up to eight passengers. 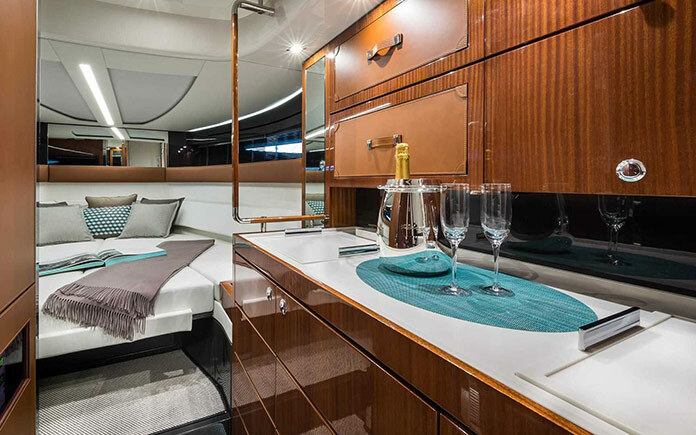 The sinuous and sleek exterior of the Rivamare is available in a variety of color schemes, such as London Grey and Ice White and the key design features of this luxurious yacht include stainless steel detailing and mahogany woodwork throughout the vessel. There is also a five-piece, double-cured windscreen for superior viewing opportunities. The windscreen is one of the most eye-catching features on deck; it comprises five double-curved laminated crystal glass sections, set in a stainless steel frame. There is a rail for the cockpit cover. 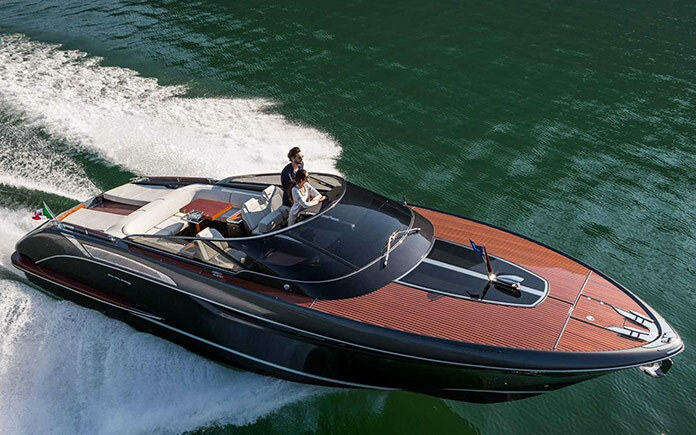 Those who are familiar with this brand will know that the Ferretti Group does not spare on luxury and detail. At the back, the transom can be opened up, creating an idyllic bathing platform. Passengers can fit up to two sun pads at the back. The Starboard storage locker is able to be enlarged to carry a Seabob. 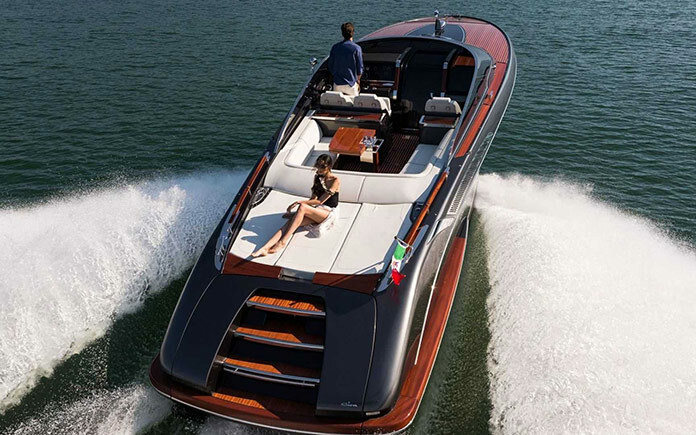 Optional extras for this yacht include air conditioning, underwater lighting, and an electro-hydraulic bimini shade. What’s more, for the first time on a Riva yacht of this size, yachting enthusiasts can order a Seakeeper NG5 stabilizer. 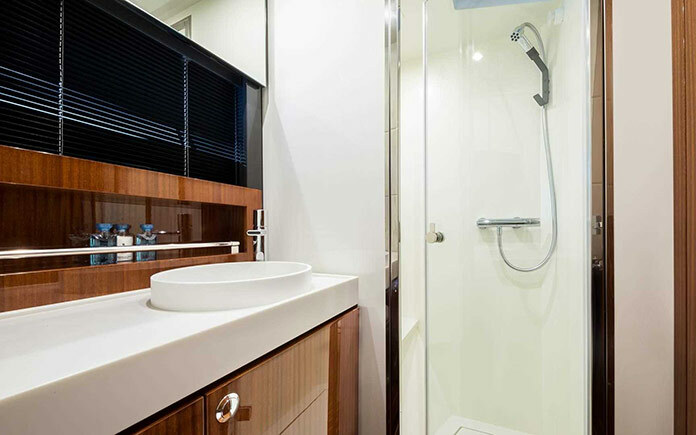 The interior of this beauty includes an overnight cabin, heads compartment complete with shower and a galley with Corian worktops. The luxurious open space comprises a kitchen and living area in the bow that can be converted into a double bed. Other design elements include carbon fiber panels, a pilothouse that draws inspiration from the sort of driver’s cabins found in sports cars, space for three passengers up front, relaxation areas and an iconic searchlight. The cockpit has been furnished with a spacious C-shaped sofa and folding table in stainless steel and mahogany. There are several technical and storage compartments. The furniture unit behind the helm station can be used as an area to prepare cocktails. This is also where the pilot and co-pilot seats can be found. On the outside, the new yacht looks enticing. The side view offers dramatic angles of the bow and keel. A pair of nighttime mooring lights has been fitted at the sides of the stainless steel pro and anchor – details that have been borrowed from previous Riva models and have become somewhat of a brand tradition. 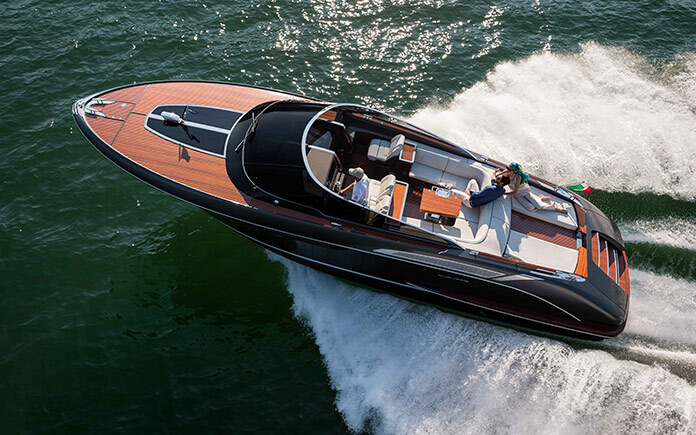 Overall, the timeless elegance of the yacht along with the mahogany shaft that serves to hang the Riva banner reminds those who enjoy yachting of the fittings found in speedboats of bygone days. At the stern, yachters will notice that both bulwarks feature sensational grilles in a polished stainless steel. 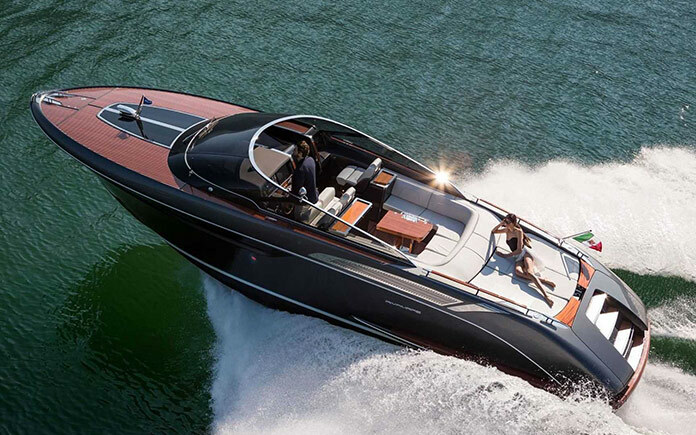 She can reach a top speed of 40 knots, with power provided by a pair of 400Mhp Volvo Penta D6 engines. The integrated control system includes docking mode functions and a Joystick, making the luxurious yacht easy to navigate in narrow waters. 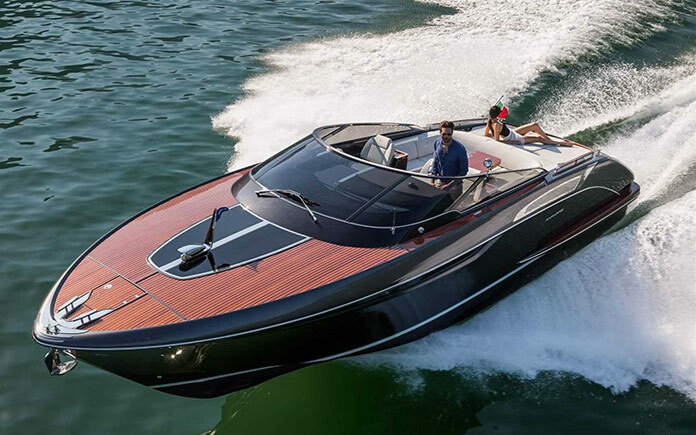 The Rivamare is sure to be the envy of the yacht club as it offers a wholesome combination of style, luxury, and performance, compared to similar models on the market. 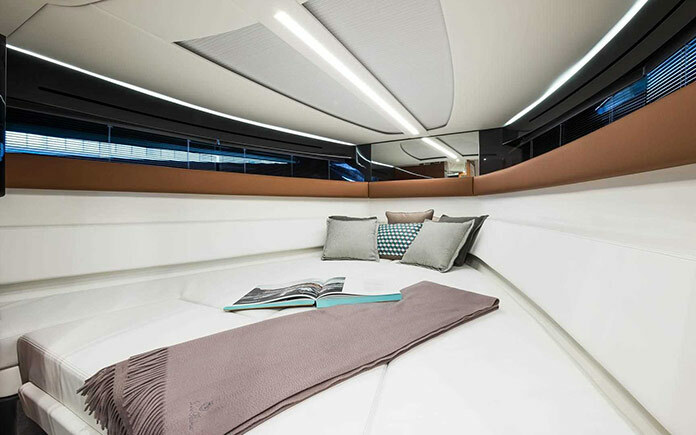 The Ferretti Group are world leaders in design. 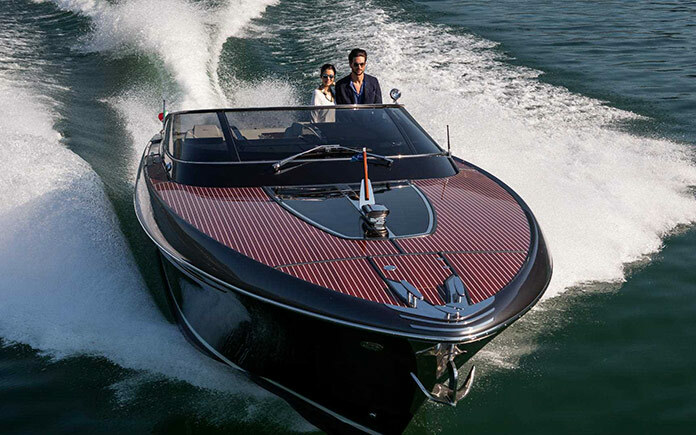 Their vessels offer a combination of world-class Italian craftsmanship and industrial production. 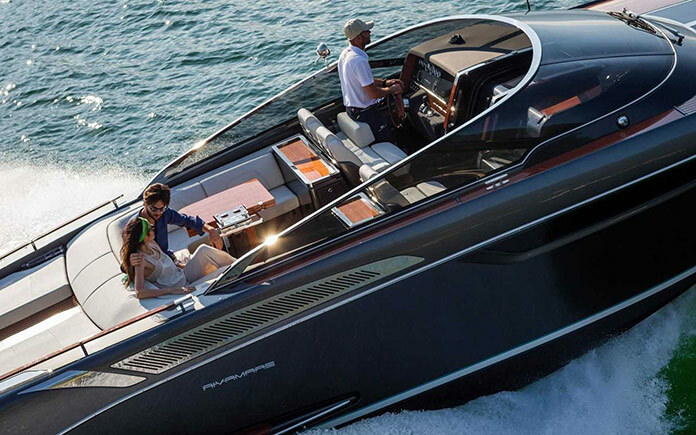 The company was established in 1968 and has remained a leader in the yachting industry thanks to their innovation and use of cutting-edge technology.